Our product range includes a wide range of gate fibre cement plank. Backed by a team of highly skilled and talented professionals, we are occupied in providing Fiber Cement Gate. 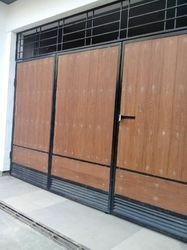 Acknowledged for its high strength, durability and superb designs, the offered cement gate is manufactured from the high quality material in conformity with international standards with the help of advanced techniques. This cement gate is available in diverse specifications as per the needs of customers. Looking for Cement Gate ?